Posted September 4, 2015 by John Schoonejongen in GabelliConnect. David Bornstein – author, New York Times blogger and entrepreneurial journalist – told Gabelli School of Business freshmen during a Sept. 2 lecture about his recent experience sitting on a beach while thinking about his work and its impact. That’s not something that everyone does during his or her down time, but for Bornstein, who wrote the book How to Change the World, the boundaries between work and fun are blurred. “It’s something that’s very exciting to me, so much so that it’s what I do during my pleasurable time,” Bornstein told the new Fordham students. 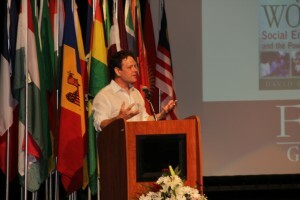 During his lecture, he sought to inspire a next generation of social entrepreneurs. He urged the freshmen to broaden their horizons, and to think about social problems and use their newly acquired business sense to solve them. “I think the greatest thing you can get out of a business school education is the freedom to build things that you love and you really care about,” he said. Start something as soon as possible—tomorrow, if you can. Go out and seek your own teachers. Seeing the world through a lens of diversity, using the university experience to try (and fail at) entrepreneurial efforts, and finding those who inspire are vital to success as an undergraduate student, Bornstein said. Bornstein’s book, a look at social entrepreneurs throughout the world and the problems they are trying to solve, was required reading for the Class of 2019. The author’s lecture, followed by a question-and-answer session with Frank Werner and Michael Pirson, both associate professors at the Gabelli School, came on the first day of fall classes at Fordham.